Hornets are a nasty pest around homes and businesses. Annoying, unsettling and potentially life threatening to people with allergies. If you are unfortunate enough to spot a concelead hornet nest, it is important you seek expert help. As one of the leading pest control solutions provider in St. Catharines, Welland & Niagara falls, we are here to take care of all your hornet nest elimination needs. From removal to prevention, our technicians can help make your home or business free of hornets. Request a FREE Quote for Hornet Removal Services in St. Catharines, Welland & Niagara falls. An average hornet nest is capable of housing up to 800 hornets, making it important for your home or business to get rid of this inconvenience. 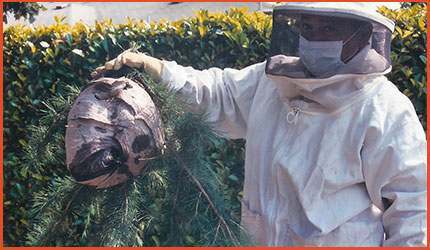 Our team of technicians offer effective and discreet hornet nest removal service at affordable rates. Our primary step is to identify the source of your hornet problem and perform instant relief treatments where possible. Our technicians will then safely remove the nest with the minimal or no fuss. We also offer consultancy on long-term measures for your home or business to avoid future infestations. Are you interested to know more about our hornet removal services? Feel free to contact us today. Looking forhornet removal services? We have the right experience in finding and eliminating hornet infestations on both residential and commercial properties. The sting of a single hornet is painful at best, but the attack from an entire swarm can be life threatening, especially for children and elders. It is crucial to identify and eliminate nests as soon as possible to ensure maximum safety of people visiting your property. The best way to deal with an infestation is to hire our professional services. By Choosing Us, You are Eliminating the Threat of Getting Stung. Hornet issues arise the most during the fall. Keeping food and drinks while outdoors covered is a great preventive method to get rid of hornets searching for food. It is crucial to take caution when shooing away hornets as it make cause them to sting. Contact our specialists for effective hornet removal services in St. Catharines, Welland & Niagara falls.